Posted on February 7, 2019. Filed under Association News. Be the first to comment. 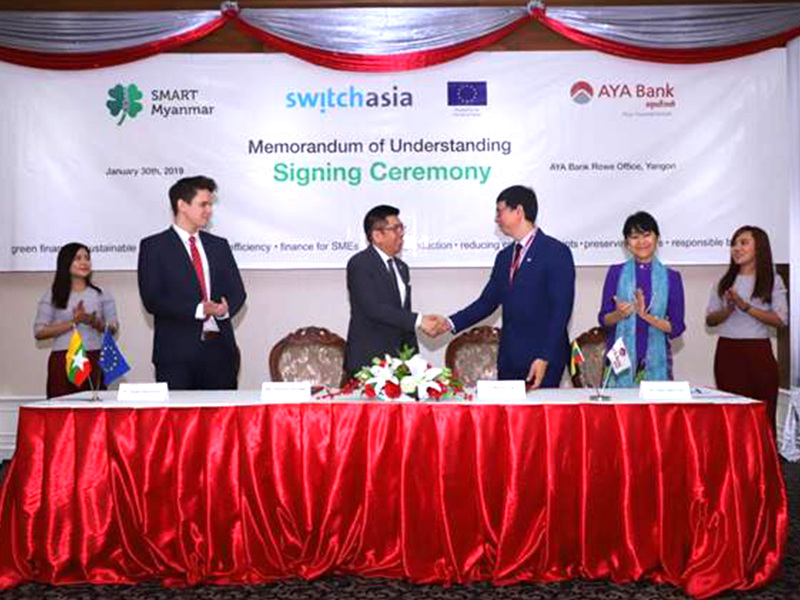 As one of the partners of the EU-funded SMART Myanmar 2.0 project and, as part of the project’s initiative to advocate for green financing in Myanmar banks, ADFIAP, represented by its Secretary General, Octavio B. Peralta, witnessed the signing of a memorandum of understanding between the project implementing organization, sequa of Germany and AYA Bank, one of the leading banks in Myanmar. The agreement signed on January 30, 2019 at the AYA Bank’s headquarters in Yangon calls, among others, for ADFIAP to provide training and advisory services to the Bank under the SMART Myanmar project. AYA Bank’s Managing Director, U Myint Zaw, who signed the MoU for the Bank, and Prof. Dr. Aung Tun Thet, one of the members of the Bank’s Board, spoke broadly about the Bank’s vision of being a “responsible bank” to help the environment, the economy, and the people of Myanmar. Focusing on small and medium enterprises (SMEs), both called for a “package of assistance” to the sector in terms of access to finance, markets, human capital, and technologies. Daw Khine Khine Nwe, Secretary General, Myanmar Garment Manufacturers Association, for her part mentioned the importance of the project to the garment industry in the country. The SMART Myanmar 2.0 project http://www.smartmyanmar.org is a 4-year EU-funded project aimed at improving production and increase consumption of sustainably-produced garments from Myanmar through up-scaling and improving on best practice mechanisms developed and implemented during SMART Myanmar 1.0.